When I first learned about the Nikon Df, I have to admit, I was pretty excited. Still primarily a film-based shooter, and a relatively recent new owner of a digital camera, I thought the Df would satisfy my desire to remain simplicity oriented while still offering me the digital capabilities required by the photographic world of today. The real question is: as a D800 owner, would the Df win me over? Backtracking some, I am most familiar and comfortable working with cameras such as the Mamiya 7II, Mamiya RB67, and 4 x 5 large format cameras. While the Nikon Df is obviously not a replacement for these, I was still delighted to have a somewhat familiar control set and basic form factor with which to work. In the summer of 2012, I acquired my very first digital camera, the Nikon D800. I saw this as the best gateway for me into a completely digital workflow, as it had the highest resolution of any camera in its class and was already well known for its ability to render a wide dynamic range. For me, this seemed like the only logical means for relieving my film gear for the time being. The one drawback, in a sense, was that there was just so much to the camera. So much video, so much autofocus, so much metering. It was somewhat counterintuitive for me to have to learn everything I could about the camera, simply so I could find the best way to ignore most of it. A year later, my Luddite attitude had subsided and I championed the all-around abilities of the D800. But when the Df was released, a bit of recently subsided nostalgia came creeping back when I saw analog dials, the ability to accept nearly any Nikon F-mount lens, and even the most negligible of features such as a threaded shutter button to accept a conventional cable release. So here I was, facing a personal dilemma for the first time since entering the digital marketplace. I knew in my heart that my D800 was a better camera, but that's hardly the reason for picking and choosing a camera anymore—if ever. Even going back to my other cameras, the RZ67 was always a better camera than the RB67, but it just never felt or looked right to me. And besides, the Df is certainly no slouch when it comes to the imagery it produces. To resolve this melodrama, I was offered the chance to review the two cameras side-by-side; my D800 versus the new Df. Before even getting into the cameras themselves, the first point to address was their cost. Nikon's hypothesis, apparently, is that value does not directly translate to raw technology and specs. In this case, there appears to be some kind of pecuniary based value attached to emotion. The difficulty with this, coming from a consumer's standpoint, is how much are my emotions worth? 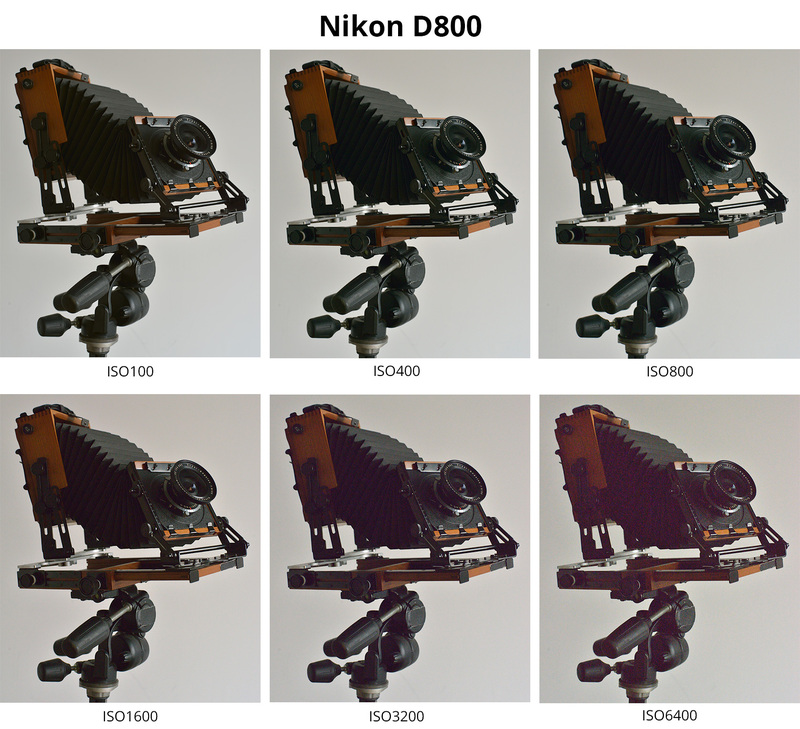 Both cameras are priced roughly the same, but on paper, the Nikon D800 outperforms the Df in most regards, with the notable exceptions being low-light sensitivity, speed, and size. From here I developed a fairly non-scientific approach to reviewing these two cameras since, ultimately, their differences and benefits cannot be measured by simple specs. I tested in two distinct ways: first, I shot in a controlled manner and worked with each camera, duplicating the settings between the Df and D800; second, since I am already familiar with the D800 and have shot numerous images with it, I felt it only necessary to give some undivided attention to the Df and use it solely in a real-world setting, with no D800 to bog me down. 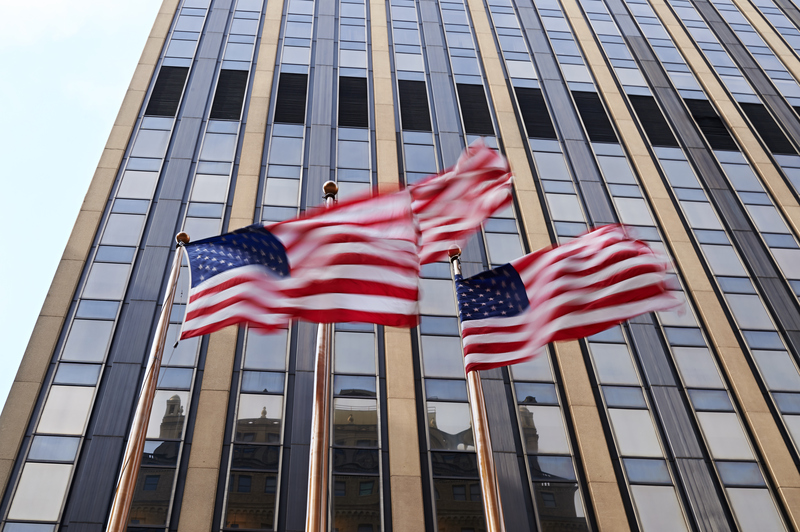 The latter half of testing, I felt, would address the position in which the Df is poised to sit in the marketplace, and I could write more about the way it is being marketed. The first portion of working with these two cameras had me sitting in my studio in an all-night-into-the-morning shooting marathon. Here, I was working with both of the camera bodies, as well as a Nikon AF-S NIKKOR 24-70mm f/2.8G ED lens and a Zeiss Planar T* 50mm f/1.4 ZF.2 lens. Each shot had me working from a tripod and duplicating the exposure and lens settings between the two cameras. I bracketed my exposures across the entire ISO range, including Lo and Hi settings of each camera, giving me 10 separate exposures per image for the D800 and 13 for the Df, and maintained a consistent middle aperture. Beyond these settings, I also worked with the Neutral Picture Control setting and kept other camera features, such as D-Lighting, to their normal base settings. What I was looking to test here was the usable sensitivity range of each camera, as well as just the sheer rendering abilities as they relate to dynamic range and color and tonal qualities. 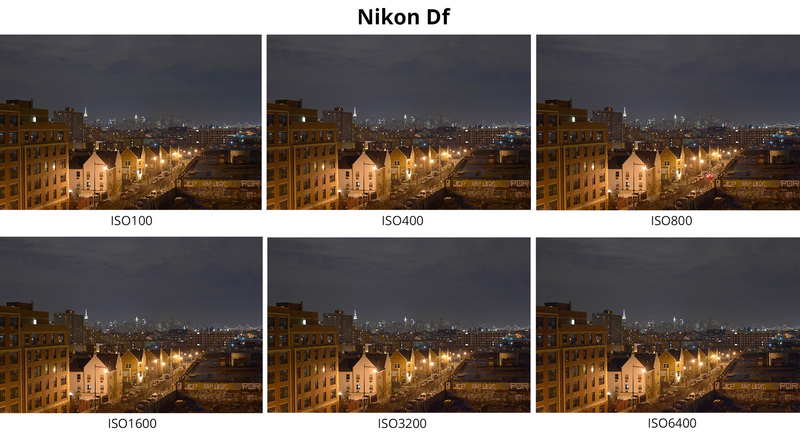 As expected, the two cameras were pretty much level throughout the base exposures up to about ISO 3200, which is where the D800's image quality began to break down in the nighttime shot. Some color noise and blotchiness developed, which became more noticeable through to Hi-2 (ISO 25600), where the image completely evaporated into a red blur of noise. 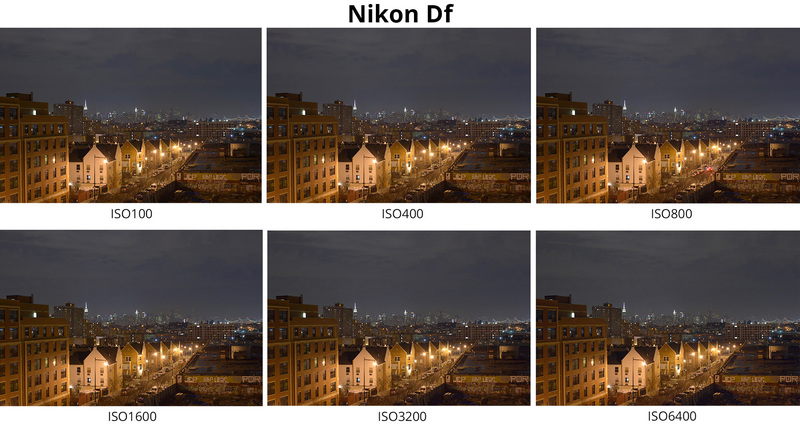 On the other hand, the Df remained relatively color-neutral, even into its own expanded sensitivities (Hi-1 and Hi-2, or ISO 25600 and ISO 51200), but at the expense of some general increasing noise and blotchiness. By Hi-3/ISO 102400, the Df began to break down into unusable-image-quality territory. By sunrise, I chose a fitting new subject—a 4 x 5 camera—to test sensitivity and image quality in a more well-lit situation. The same test was run, and the results remained relatively the same. However, when working with subjects in daylight settings, the appearance of noise didn't begin to affect the image quality nearly as much as it did during the nighttime shot. 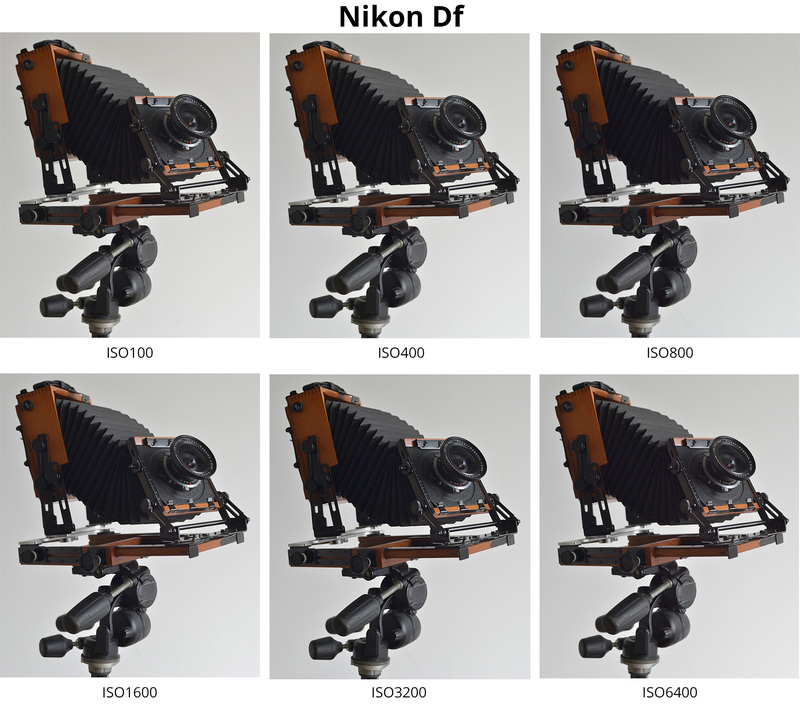 The black areas of the camera, notably the lens board and the bellows, are the main regions where noise is more apparent and is the clear distinguisher between the D800 and Df. Looking back at these two tests, they pretty much told me what I had already expected, but obviously in a much more visually representative manner. The Df, with the same 16.2MP sensor in the D4, held up against high sensitivities better than the 36.3MP sensor of the D800. Both cameras, however, went toe-to-toe throughout the native ISO settings and, in my opinion, the D800 takes the edge with greater detail and higher resolution. To each his own, though—both cameras were capable of delivering excellent image quality. After becoming acquainted with how the Df performed at the studio, and how the imaging attributes of the two cameras compared, I set out to test what, to me, was ultimately the whole purpose for comparing these two cameras. The results of the side-by-side shoot-off were predictable, but these tests hardly play into the one feature that the Df Nikon is banking on: how it handles during a normal photo session. In order to accurately test this, I felt it necessary to use the Df on its own, uncoupled to the D800 so I could, as Nikon puts it, "rediscover the joy of photography." When working in a testing methodology, you are hardly reaping the supposed benefits or experiencing the nuances around which the Df is designed. The mechanical dials and forced slow pace that the Df is meant to instill cannot truly be seen when working with the camera atop a tripod, making sequential exposures. So I left the city with just the Df and its kit lens, the AF-S 50mm f/1.8G Special Edition, to simply use the camera and experience handling it on its own. This is where the Df differentiated itself from any other digital camera I had ever used. The ergonomics felt familiar, but still did take some getting used to and, unfortunately, weren't as instantly intuitive as I had hoped. After the initial learning curve of only an hour or so, I felt like I had the control set down with some minor tweaks to the preset configuration. My first point of contention with the physical design of the camera was the front-most dial, the sub-command dial, which is programmed as the aperture selector by default. Compared to the D800, on which the sub-command dial is set within easy reach of the right index finger when shooting, the Df's front-mounted sub-command dial was much less accessible. It is tightly tuned, making it somewhat difficult to adjust with just the tip of the finger, and was also harder to manipulate when the camera was held to my eye. In order to resolve this issue, it was easy enough to swap the functions of both the sub-command and main command dials so I had aperture control via the rear, thumb-accessible, main command dial. Since I most often work in aperture-priority mode, this seemed like a more natural fit. The one caveat to this is, if working with a lens with an aperture ring, you can set a custom option to have the aperture setting controlled manually via the lens ring, leaving the main command dial available for shutter-speed selection when working in manual modes. In either case, I found myself gravitating toward working in ways in which I could avoid using the sub-command dial whenever possible. The second aspect of handling I felt was particularly unintuitive at first was the switching of ISO sensitivities, mostly related to how the ISO sensitivity dial and its respective lock button functioned together. Unlike the exposure compensation dial, which is mounted atop the ISO sensitivity dial, and features a centrally positioned locking button, the ISO sensitivity dial's lock button is set off to the side and must be held down when switching between sensitivities. In this configuration it was more difficult than necessary to switch between sensitivities without using two hands or a slightly cumbersome one-handed action. Regardless, after becoming accustomed to this, it didn't bother me so much, since I rarely switch ISO speeds that frequently. Furthermore, there is also the option available to use the Auto ISO function, via the menu system, which often negates the setting of sensitivities with the dial altogether. These two physical design nuances seem to be the result of trying to fit a digital camera into film camera's clothing. On film cameras, on which the Df is based, there was no need for sub- and main command dials, and as such, the location of the sub-command dial feels especially out of place. And in regard to the ISO dial, it is set to lock into place just as one would want when working with a film camera. This difference here is that you are not confined to a single ISO for the duration of a 36-exposure roll of film, so it would have made more sense to make the dials a bit more friendly to the more contemporary, more digital way of shooting, where ISO can be variable from shot to shot. Beyond these initial hurdles of configuring the camera to function more intuitively for me, there were numerous assets the Df afforded that outshone a few of its shortcomings. In physical design alone, besides the initial drawbacks previously mentioned, the feel of the dials when they are turned is a welcome change to functioning only on the command and sub-command dials of the D800; especially in regard to the mode selector dial, where you pull up and turn the dial to switch between PASM modes, as well as the drive mode switch that offered an especially satisfying "click." One of the other main design elements that harks back to the film era in a truly positive way is the incorporation of a folding Ai indexing tab in the lens mount. Not seen on Nikon cameras since the F5, this selectable tab permits the use of older, non-Ai lenses without the worry of damaging your equipment. I didn't have an old enough lens to test this feature, but was excited enough by the ability to make use of legacy equipment that all other Nikon DSLRs have effectively rendered obsolete. One point worth noting in regard to this feature, however, is one downside to almost all DSLRs in comparison to their film SLR brethren: the Df does not afford one the opportunity to (easily) switch focusing screens. As someone who prefers to work with manual focus lenses, this has been one of my gripes from my early days of working with DSLRs. It is something that one must come to accept with a camera like the D800, but with the Df, it seemed to signal an oversight by Nikon. They went out of their way to incorporate a feature that enables the use of a wide array of manual-focus-only legacy lenses, yet didn't see this implementation all the way through by also permitting the switching of focusing screens, or even better, including a split-prism focusing screen as standard for the Df. It is somewhat aggravating that they would invite and encourage you to use legacy lenses, but limit your manual-focusing abilities by something as plain as a their Type B BriteView Clear Matte Mark VIII screen. To truly reap the benefits of working with a manual focus lens, and to reinforce the entire physical design of the camera itself, there should have been at least the option to insert a split prism focusing screen in order to gain a more comparative method for focusing. On the other side of the focusing coin is the autofocus performance. For my own purposes, I felt the 39-point system, with nine cross-type points, was adequate for the subject matter and pace at which I shoot (and the pace the Df seems to force upon you). It would hunt for focus at times in less than ideal light, but never to an extent with which I'd be concerned. When locked-on, too, focus was sharp and accurate. When working with moving subject matter, the focus would miss more frequently. Interestingly enough, when compared to the D800, which is not designed for low-light shooting or action shooting, the Df's AF system is lesser in both regards, where its imaging performance excels in comparison. On the positive side of shooting with the Df, in short, it is just fun to work with. Even though some of the control designs took a little getting used to at first, the Df is certainly a tool designed for tinkering. Unlike something more automated, this camera embraces the fact that you must be cognizant of everything you are doing. In turn, this leads to being able to produce photographs with a greater feeling of confidence and definition. As a tool, it isn't the most efficient for accomplishing tasks in a speedy manner. But when you want to photograph for the sake of enjoyment, the Df holds its own as one of the more pleasurable shooting experiences I have had in some time. It broke up my working process and injected it with a good dose of technical reasoning, which in some nostalgic-related ways, was comforting. To call this "pure photography," though; I'm not sure. That description would almost fall more in line with a fully automated point-and-shoot in many ways. Rather, after use, I feel like a better tagline for the Df could be something more along the lines of "make photography your own" or "for those who wish to toil." And as another analogy for many, this camera is the equivalent to Legos in the age of Nintendo. It is fascinating, frustrating, and rewards those with patience, in spite of other more technologically advanced options around. Beyond any tagline or attempt to equate this camera to something, it must be reinforced that the imaging capabilities of the Df are second to none. 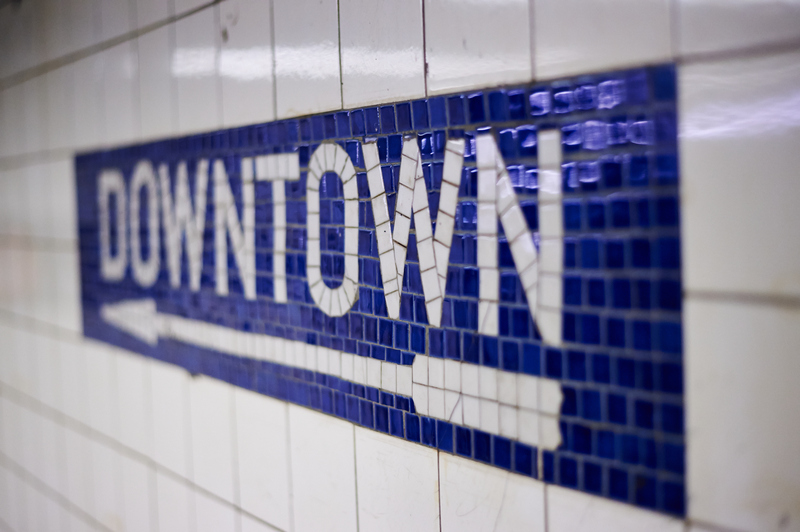 By employing the same image sensor as the D4, one would expect this to be the result, and it is somewhat unfortunate that the sensor, in many ways, takes a backseat to the more controversial attributes of the camera's design and performance. In the end, image quality is all that really matters from a camera; it doesn't matter what it took to get the shot if the results are still there. The image quality is fantastic from both sensors, but I would be lying if I didn't wish the Df had a higher resolution for printing purposes. One of the main reasons I initially chose the D800 was for its ability to produce a file size similar to that of a normal scan of film, and for this reason alone the Df is not suitable for my needs. For most, though, the 16.2MP resolution is suitable for general needs and the 36.3MP resolution of the D800 is much higher than needed. In most cases, I would choose the high resolution of the D800 over the high sensitivity of the Df, but I wish there were something in the middle available: a D800 with an extra stop of ISO and a slightly lessened resolution could work well. I was surprised at how my initial reaction to using the Df changed over the course of becoming more accustomed to it in a more complex way than anticipated. Certain aspects I learned to love (the handling in most regards, the looks, the slower pace it demands) and certain aspects, I realized, were just not designed with me in mind (the sub-command dial, the focus screen, and the somewhat mixed and matched feature set in general). Both cameras feel comfortable in the hand; the D800's grip is a bit more solid and ergonomically pleasant overall. I'm a bit puzzled at the choice to not incorporate video-recording capabilities in the Df. Not that I would use it, though. With the chance of sounding a bit hypocritical, I wish the opportunity were available despite the fact I have only recorded video twice in more than a year with my D800. Even with as much criticism one can dispense on the Df, it must be highlighted, reinforced, and stated constantly: the Df is an excellent camera. It really is. What it is designed to do, it does very well. It is just difficult and cumbersome at times to realize this. In my own ideal world, I would love to see a meshing of the D800 and the Df: a high-resolution, high-performance, stripped-down model that helps to arrive at the final destination in the most simple, straightforward path. This simple path is ultimately what Nikon was searching for when designing the Df, and while the path is there, it is not quite as simple or accessible as its designers may have intended. I loved the way you have commented on both cameras the D800 and the Df. I am not in the position to buy a dfso I better stick to my d7000. and my Nikon f100 and f6. they are all thre wonderful tools to work with. If comes to the last two I prefer to work with the F100 over the F6. Ever since the birth of digital imaging I had hoped for something like the Df. Leica managed to create one with the body form of an "M" series camera so why on eart could Nikon not have made a beautiful one similar to the F2 meterless body since miaturisation has surely left enough space in a body of that size. The Df is clunky and ugly, more like their mid range film cameras. Manual musical instruments are handled naturally and instinctivly by their owners, the controls just fall to hand. How could someone think clunky controls would be a good idea? Many years ago I bought two camears at the same time, one for work and one for pleasure. The leica had a few brief pages of instruction but most of it was about how you would love owning the camera and what a treasure it was and needed no instruction how to use it beyond a quick film loading instruction and wished you happiness using it. The Nikon F5 had over four hundred pages! It was the dullest film camera I ever owned and gave no pleasure and though imaculate soon had almost no monetary value much like all the DSLRs which have followed it. I have gone to a similar philosophy, I just label mine a bit differently...... :) I call one set my cameras for "client projects" and the other set is for my "personal projects". The Df has now become my "personal project" camera. I have been very pleased with the images, my ability to manual focus through it's bright viewfinder, and as a life-long Nikon user, I love the dials which are so similar to the FA/FE/FM series cameras. One other note on how I use these cameras, I do stuff my spare Df in the case when I go to client jobs on location, as a backup body for my D800e..... Just like I did with the FE2 for many years. My D800 is always in the studio, the D800e gets the battery pack and travels to visit customers but, stashed in a small corner of my wheeled camera case, is a Df...... just in case. BTW, AiS lenses are plentiful and work great on the Df. Zeiss ZF (not ZF.2) lenses would give you the same feel. One surprise I found was that any 'chipped lenses (i.e. D and ZF.2 lenses) were forced to use the dial in aperture priority mode. I was a little disappointed by this...... maybe it is a changeable setting? Good luck in your search for your "fun" camera! One surprise I found was that any 'chipped lenses (i.e. D and ZF.2 lenses) were forced to use the dial in aperture priority mode. I was a little disappointed by this...... maybe it is a changeable setting? In "CSM f7 - Customize command dials" select Aperture setting and set it to "Aperture ring". This allows you to use the aperture ring with chipped and D lenses, but when you put a G lens on it automatically goes to the default of using the dial. "Looks like I shall have to wait some more for a real film like digital camera but now that the aperture ring has been so unceremoniously killed off I suspect it may never appear..."
señores me pueden hacer el favor de enviarme esta información en español " I do not speak english "
Por favor, envíenos un correo electrónico a spanish@bhphotovideo.com con sus preguntas y nuestros Agentes le ayudaran. Gracias. Would you choose the Df over the Sony A7 or A7r which are half the size, have video mode, has the greater resolution , is cheaper. and you can get an adapter for just about any lens you want to mount on it? I fail to see the value in the Df. It's beautiful but I just can't get past its shortcomings. I totally understand your stance, however there are many users out there who want a camera without video, and in some instances work in environments where cameras without a video feature are prohibited. The DF would be a professional level model for those users. Further, this is an appealing model to shooters from previous generations who enjoyed shooting manually and are accustomed to having their dials and buttons on the exterior of the camera for quicker adjustment as opposed to menu-based changes. The fact that the DF is also compatible with any legacy Nikon F type lens is another great appeal to many users. The D800 would be more of a comparable model to compare to your A7/A7Rs for sake of argument. Because (in my experience) Sony cameras, whilst they perform well, break frequently and are not durable. I now been through 3 x RX1's, and won't have another Sony. Have shot maybe 20 difference Nikons (film and digital) over a while, and yet to have a single issue with any one (touch wood). I have not seen or used a better priced camera than the D-800. I use the D-800 on the dessert. It had never failed me with one exception it failed to turn on after 9 months. Nikon promptly fixed the camera. It is a bit heavy but the weight is expected. I wish I knew all of the D-800 many features. Using is the best teacher . A very enlightening article, useful to me since I have been in the market for a full frame body. Upgrading from a D7000, the research process has lead easily to the D800, but since the introduction of the Df, I've wondered about it's possibilities and this article has given much needed practical consideration to my final choice of the D800. Thanks! I am 80 years old, enough said. I had no trouble with exposure or focus back in the days when the world wa 99 % Kodachrome and Tri-X. Handling aside, I have finally acclimatized to every camera I have needed to use, I am increasingly put off by the proliferation of "things"
concerned and the df is a step in the right direction. I really appreciated with your comment and suggestion .. Actuallly I'm not a real photographer only one of my hobbies but I learnt photograpy fm my Nikon film cam so I always happy with the the which is no need to retouching in frontbof the photoshop and I prefer to use lowest iso setting esp for taking every picture . While I am a little under half your age, my photography equipment and technique experiences mirror yours. Well, until 2008 when I bought a D3, but that is another story. The Df, for me anyway, is a complex love affair. It is not quite a digital F3/FE2 but it is not quite a D800 (or D4) in film clothing either....... There is, like in any relationship, give and take. I don't like that I am forced to use the aperture dial instead of the lens ring on "D" lenses. I do like that it forces you to slow down and to "be present" in your photography experience. If you ever used an FA, an FE2, an F3, or an F4 then the dial configuration will seem mostly familiar. If you have ever used a modern Nikon DSLR, the menu will seem mostly familiar. You can use your Df, for the most part, the same way you used the aforementioned film cameras. The only thing I did really different (once my menu was configured and saved) was to use Live View when I had an area of an image in which the focus was critical as Live View allows you to zoom right into that area and perfect your focal point. Then I would shut the feature off and work like film again..... I use a hand-held light meter. I will manually use the camera's spot meter, when incident metering is not possible, to build an average exposure from my "important" areas. Will I give up my D800-series bodies for client work? No way, they are too good and allow you to work faster. Do I feel more creative and spend more time being "in the moment" when I use the Df? Absolutely. Will I give either up? Not if I can help it as each has its own strengths which better dovetail into a given aspect of my overall work. Good luck to you Bryan. Enjoy your photography! In the settings you can change it so that you set the aperture by using the aperture ring on your D-lens instead of the control wheel. I agree that the camera should come this way by default but for some reason it doesn't. The proper or best exposure settings such as ISO, WB, and aperture etc ultimately depend on the environment you are working in, the subject, and the lenses you are shooting with. My best advice is to experiment with the settings to see what results suit your needs. If there is a particular type of photography you have questions on, or for specific tips etc, feel free to send us an email to askbh@bhphoto.com and our agents there can further assist you. Great article, confirmed my suspicions! I'm a D800 user with half-an-eye on the Df - and your article has made me realize why I should stick with the excellent D800 I already have. Thanks a lot! Have you tried shooting with any of the Leica cameras such as the M9, Monochrom or M.
Until now I've been using medium format and 35mm film cameras like yourself, not so much for the medium, but because the ergonomics of dedicated physical controls is key for the type of photography I am interested in. I am absolutely convinced that for fine art photography and other fields that require the photographer to challenge him/herself creatively it is important to be in full, direct, control of the camera. For these reasons I regret that Nikon cheaped out and didn't have the guts to go all the way. There shouldn't have been autofocus. No control wheels. I can stretch to include aperture priority but preferably not. Leica has perfect ergonomics except for ISO dial where the DF is better. I don't understand why you reviewed the DF with the plastic snapshot kit lens? When I read your text it seems like you understand the concept and advantage of manual operation and still you choose an automatic lens?!? Using the 50mm 1.8G doesn't make the DF anymore manual than your D800 with that Zeiss lens. On one camera you have proper controls for shutter speed and ISO (DF), on the other you have proper controls for aperture (D800). If you wanted to review the DF sincerely you would have put the Zeiss on the DF and then done your walkabout, camera set to 'M'. This is where the DF shines. This is where the whole point of the camera is, but like most others, you almost totally ignored it. You talked about AF specifications and bla bla bla. If you want automatic focus and automatic exposure, get another camera. Simple as that. Don't even waste your time reviewing the DF like you would a D610 or a D800. It's a different camera, dont you see? I guess not. Thats what made Steve Jobs great – he really understood how easily confused people are, how design needs to be ultra-precise for concepts to make it through. Leica alone gets the importance of simplicity in camera design today. Unfortunately Leica is very costly. Oh how I wish that Nikon included the 50mm 1.4 ais Nikkor instead. There would have been so much less misunderstandings.You spend ages discussing the idiotic sub command dial. Why? Why would you buy this camera to use it like another snapshot-machine? The whole point is manual controls. That's the main point of the camera, why it exists. Why not focus on the main reasons in your review? The control wheels are just there as a complement. I suspect for the people having a full set of G lenses. I am very grateful for the locks. They are there like they always have been on Nikon cameras. After a week of two using the dials I promise you don't realise the locks are there. The motions become automatic and the locks are not in the way at all. When you tested the ISO you also did it the same way as everybody else. The D4 sensor shows advantages in these tests as well but why not show where the bigger, better pixels really come into play? Why not be a little creative with your review instead of just shooting another bookshelf at 6400? I think one of the biggest pleasures the D4-sensor users enjoy are how the files behave much better in the digital darkroom. When you start pulling exposure, applying filters, making adjustments, et c, the DF files hold up extremely well. This is one of the biggest advantages of the files you get from those huge photo cells but this is another capital point of the DF that just gets ignored as usual. As 95% of other reviewers you apply the conventional ruler where AF speed, resolution, matrix metering, auto-functions and so on are given most attention. The spec points the gear heads love. Why not take a couple of shots where you completely miss exposure on the different cameras and then watch what happens when you try to correct in the darkroom and in printing? Why not focus on the smallness of the DF? The lightness, the intuitive real world controls that puts responsibility on the person holding the camera, the quality of the files? If you review the Leica, would you then bash its lack of autofocus or that you can't see through the lens? No of course not, because if you did it only proves that you don't understand the concept of the camera. The Monochrom for example, is a truly great camera, but a lot of people just don't understand the concept. It used to be this way with Mac computers as well. People just didn't get why you would choose to "say no" to some things. Including the AF, wheels and lots of other functions on the DF was a capital mistake in design. But it is still completely possible to enjoy the camera manually. Luckily the wheels are discrete and you don't see them when you never use them. The mode selector is discrete and has a robust lock. So when you use the camera in M with aperture ring, shutter dial, ISO dial and focus manually, everything else dissappears. Its only you and the world. You make pictures. When used like this the DF is a unique and wonderful camera. I love mine more for every day. Sometimes I'm annoyed that I'm carrying around a stupid AF-module, but it's okay. 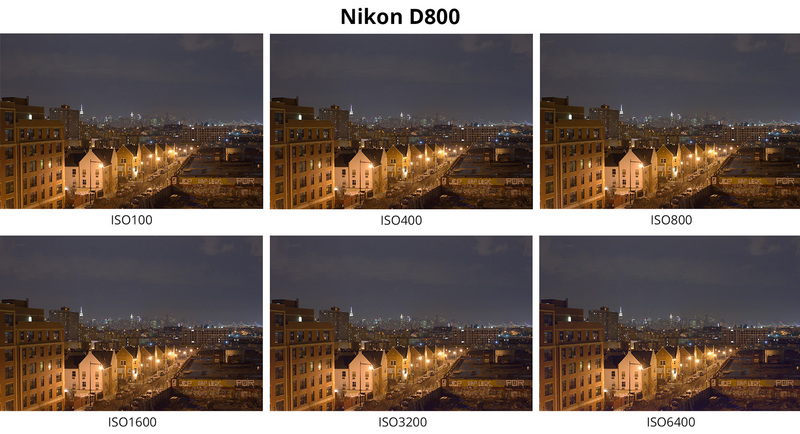 The DF is not comparable to a D800 in any way. It's a different concept. It would be similarly stupid a compare a Leica M9 with a 5D mark III. The ones who do don't understand design or how design works together with the end result. Simple as that. My advice to you try the DF for a couple of days using only a manual prime lens. Then you can come back with a review. My feeling is also that, if you don't need snapshot machine, you'll sell the D800 and get a DF. Meaning you can occupy the exact same cognitive space as when you where working with the awesome RB67. glad you understand how wonderful the df is. People are completely missing the boat on this brilliant camera and fine by me. One, the idea of a split screen which you can just remove at will is a ridiculous notion on a digital body. The screen in the Df is far better than the screen in my FE. Which, is difficult at best to use in low light. I'll take the brightness of the Df's any day of the week. The dials can all be rationally justified by Nikon engineers. However, I hear the same complaints over and over again. It's like these reviewers all regurgitate each others reviews. And yes, the sensor in the Df is where the magic lies. Nikons best sensor. So, you're getting a stripped down D4 for less than half the price. And it doesnt look like a big chunk molded plastic. 36mb scans from negs vs sensors of the same size isnt really a rational argument. Its a little more complicated than that and the reason why I've pulled prints off of a 12mp point and shoot which look better than scanned e6 and c41. If you know what you're doing the 16mp of the Df is enough to go a few meters. Its also enough to rival 100 iso Provia scanned at around 50mb. Throw in the fact that you can shoot clean at high iso, which is something you could never do with film under the same conditions or with the large d800 sensor which makes a mess out of low light environments. A larger sensor with this kind of quality? No, not yet. Theres a reason the D4s uses this sensor and some people still prefer the D700 over the 800 and the D3 and s over the D3x. This is the sweet spot at 35mm and is plenty of resolution. If you want mass pixels you really should go medium format. Its the same reason why the fuji xt1 struggles in certain areas. The 16mp of that sensor is pushing the boundaries of what you can realistically cram onto a smaller sensor and not suffer from serious deficiencies in tonal values and noise. By all means though, keep playing the pixel war's. I'll be out making images at dusk and at night that look like they were some how magically captured with 100 iso positive film with the dynamic range of bw. Btw- I still shoot film and love film. However, the Df is my favorite camera of all time to shoot which doesn't utilize it. That's right. I read the review again and I'm struck by how the reviewer doesn't give the Df a fair chance at all. 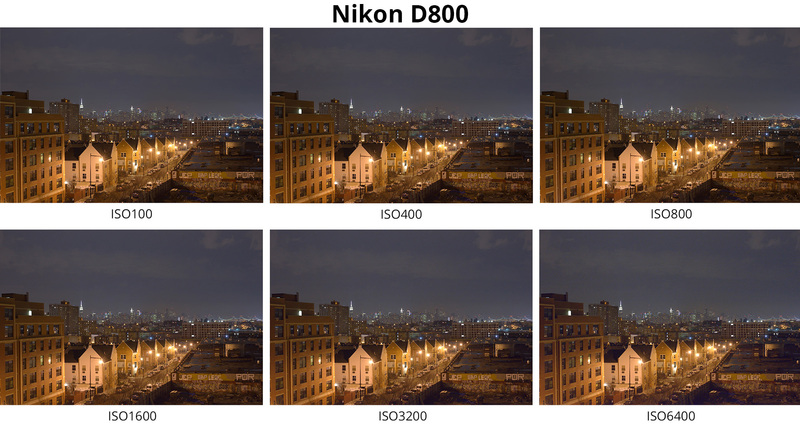 To anyone who reads it I would encourage you to try the Df vs D800 for yourself. You really need to see them in real life. The difference in size and weight is huge. The D800 is a much bigger and heavier than the Df. It might not look like a big difference in pictures but believe me, when you hold both in your hands its a big difference. Another thing the reviewer comfortably omits is that the Df viewfinder is superior to the one on the D800 (or D610). It is a subtle difference but if you're someone who uses only manual lenses and has a trained eye this is immediately obvious. 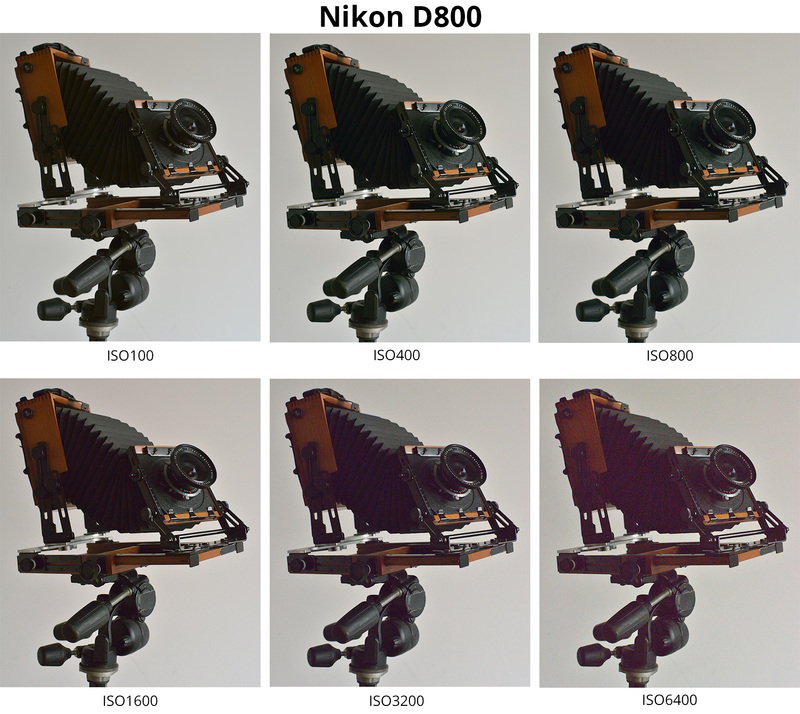 The D800 screen is much more "washed out" with less contrast and saturation. This doesn't only make the Df nicer to look through but also means that pictures snap much better into focus when you focus a manual lens. Nikon expert Bjorn Rorslett has described this extensively but it is something often missed by reviewers. Another thing the reviewer omits is the Df's compatibility with old lenses. This is more common in the film world where many cinematographers use old Bolex lenses to get the unique quality of lens flares and other artifacts you got before modern coatings. On the Df you can pick up an old Nikkor from 1960 and it will fit natively and give you a unique palette no present in modern lenses. I was honestly reading your post for awhile, under I realized that you come off as some sort of very gear oriented diva. Steve Jobs? Mac? Leica? Really? Lets say someone uses a D810. He can use it quicker, and for wider styles of photography that it's possible with Df (I'd argue). Simply because you have more buttons to customize for your own needs/functions. You get the same "manual" function as you do with Df (actually, better than Df), because you can use main dial for aperture, sub-dial for shutter, AND movie + dial for ISO ! That's a very very quick workflow for diffent kind of situations, from low light event shooting, to portraiture, BIF / sports..
Matter of fact is, I think it would be hard to work with Df for action photography. For someone like me who values quick functions/control over the camera system (contrary to that ISO dial which is locked on Df), Df's strong point is only its sensor, and its possible better rendition of depth and color rendition. I really wish people like you wouldn't post on the internet, as you didn't even attempt to provide something to digest, you just threw your assumptions and opinions like they belong to everyone. Well guess what, not everyone feel need to buy Leica (or zeiss) optics, especially since Sigma Art lenses are starting to catch up (or surpass), and only for fraction of the price. You shouldn't have left the apple store. Like 90% of the internet you don't get this camera. I'm shooting a D600 and have an F3 for fun. People are complaining about the controls on the Df. They're practically the same as on the F3. The feel is almost the same, although the Df is somewhat bigger. I was thinking of buying a Df and when I felt it and compared it to the D750 I knew (with some pain in my heart) I would go for the D750 because it handles exactly like the D600 which I use for clients. The D750 will be a good continuation while working, but for fun, I use the F3 and the Df would be the perfect follow up, without the use of film, which I'm not so attached to really. However, for the price it's too much for me and I have to choose. It's what you're used to work with. I couldn't do a wedding with an F3 like I do with the D600. Maybe that's my lack of skill but why would I? Clients satisfied, I'm satisfied. And I will save for the Df, for fun and slow work. It forces you to make different photographs. A prime, a fixed ISO, and just aperture and shutterspeed, that's the only thing you need. Perfect analysis - agree totally about the 50ais lens vs the plastic kit. I use my DF with all manual Voigtlander and Nikon AIS lenses and put the plastic kit lens back in the box. Its a pleasure to use - but you have to know why you want this camera before you buy it.